Silicon Valley ventures may become more frequent for NBA players and professional athletes in general after The Players Technology Summit. 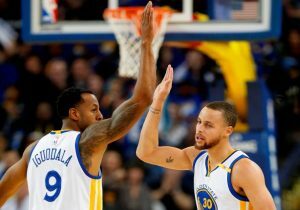 Warriors stars Stephen Curry and Andre Iguodala will host the summit Aug. 14-16 in San Francisco, as announced Monday. 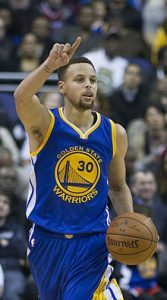 Curry specifically touched on the connection between professional athletes and venture capitalists. ‘Gold Standard’ chronicles the Warriors’ run to the 2017 NBA Championship. Order the book here. In regard to this event, Curry surrounded himself with Iguodala — who is already entrenched among Silicon Valley VCs. Curry is a co-founder of the marketing startup Slyce and an investor in mobile applications like Pinterest while Iguodala is an investor in companies like Thrive Global and The Players Tribune. They both seemingly envision more athlete involvement in tech investment. Wardell Stephen Curry II (born March 14, 1988) is an American professional basketball player for the Golden State Warriors of the National Basketball Association (NBA). Many players and analysts have called him the greatest shooter in NBA history. In 2014–15, Curry won the NBA Most Valuable Player Award and led the Warriors to their first championship since 1975. The following season, he became the first player in NBA history to be elected MVP by a unanimous vote and to lead the league in scoring while shooting above 50–40–90. That same year, the Warriors broke the record for the most wins in an NBA season. After losing in the NBA Finals in 2016, Curry helped the Warriors return to the Finals for a third straight year in 2017, where he claimed his second NBA Championship. 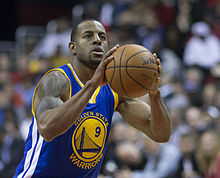 Andre Tyler Iguodala (ig-wə-DAH-lə; born January 28, 1984) is an American professional basketball player for the Golden State Warriors of the National Basketball Association (NBA). The swingman was an NBA All-Star in 2012 and has been named to the NBA All-Defensive Team twice. Iguodala won an NBA championship with the Warriors in 2015, when he was named the NBA Finals Most Valuable Player. After losing in the NBA Finals in 2016, Iguodala helped the Warriors return to the Finals for a third straight year in 2017, where he claimed his second NBA Championship. He was also a member of the United States national team at the 2010 FIBA World Championship and 2012 Summer Olympics, winning the gold medal both times. THE TEXAS RANGERS WINS THE BIDDING SWEEPSTAKES, ACQUIRES THE RIGHTS TO YU DARVISH, THE JAPANESE PITCHING SENSATION!!!!!!!!!!!!!!!!!!!!!!! TIGER WOODS IS IN THE HUNT FOR THE EMIRATES AUSTRALIAN OPEN, WILL HE GET HIS 1ST WIN IN OVER 2 YRS?